Read one token out of the stream defined by a pair of iterators. Do not read past the end of the token stream. When end of stream has occurred, the returned token type will be CPP_Token::eof. Given an arbitrary string, determine what kind of token it is. The return value will be one of CPP_Token's types. The token is assumed to be aligned at the beginning of the string with no leading blanks, tabs, etc. Skip characters in the stream until the first nonblank character is found. Handle line number changes in blank sequences. C++ token stream template (ie a source of CPP_Token objects). 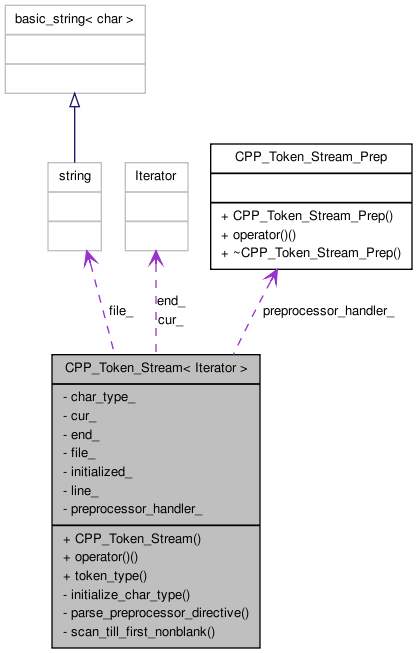 A CPP_Token_Stream<Iterator> is a sequence of CPP_Token objects. 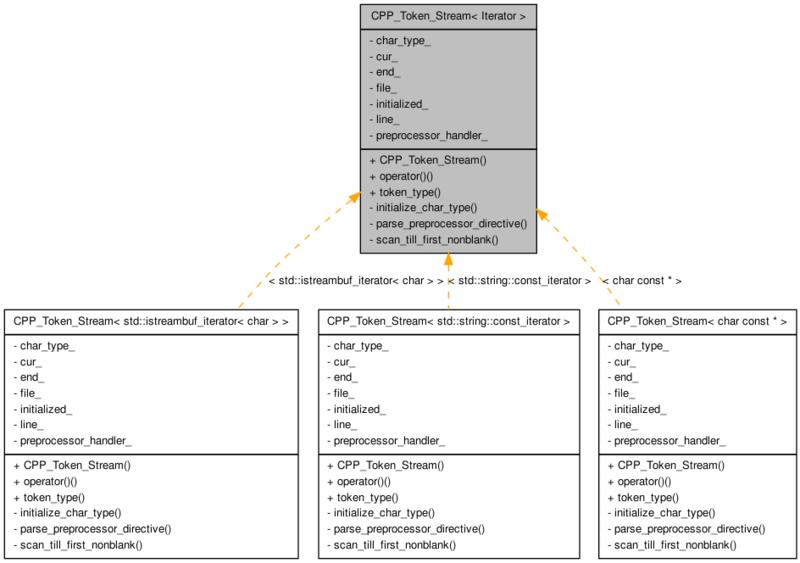 A CPP_Token_Stream is a functor object. Use its function call operator to get the next CPP_Token out of the stream. Definition at line 210 of file cpp_token_stream.h. < Construct a token stream from a pair of iterators -- with optional settings to define the name of the file being parsed and a handler object that handles preprocessor directives. Definition at line 264 of file cpp_token_stream.h. Definition at line 911 of file cpp_token_stream.h. token is the place to store the output token. Definition at line 284 of file cpp_token_stream.h. Definition at line 963 of file cpp_token_stream.h. Definition at line 1171 of file cpp_token_stream.h. s the input string to check on. Definition at line 660 of file cpp_token_stream.h. Definition at line 259 of file cpp_token_stream.h. Definition at line 258 of file cpp_token_stream.h. Definition at line 252 of file cpp_token_stream.h. Definition at line 253 of file cpp_token_stream.h. Definition at line 255 of file cpp_token_stream.h. Definition at line 256 of file cpp_token_stream.h. Definition at line 254 of file cpp_token_stream.h. Definition at line 257 of file cpp_token_stream.h.